Hello! Can I just take a second and apologize for not posting for a while? No, there is no baby announcement or otherwise good reason for the long break. I'm just lazy. And busy with my kiddos. And generally lazy. But I really am sorry to leave you hanging. I know I can get sad when blogs I follow just stop being updated and I spend time wondering what happened and where the authors went and how their kids/spouse/cat are doing so I'm sorry if this happened to you. I doubt my laziness will go away, and word is that the kiddos are going to be around for a while so I don't think I will ever be back to a very regular schedule but I hope to put a recipe on here every once in a while to say hi and share with you. I've told so many people about this recipe since I tried it for the first time last summer that I overcame my posting laziness to write it up on here. That alone should tell you that it's good. 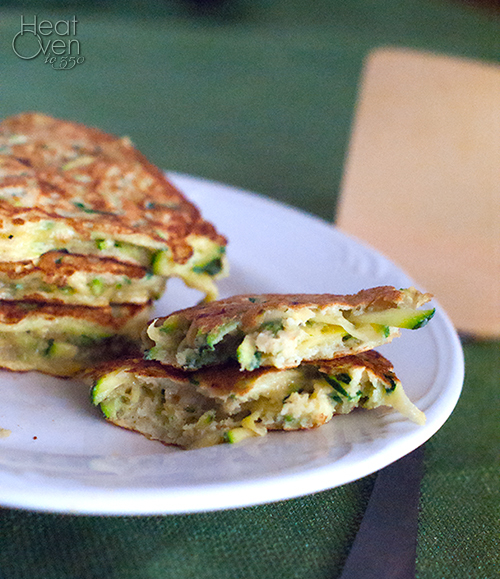 It's simplicity and ease itself and manages to use zucchini in a way that is not sugar filled. (Not that zucchini bread and cake doesn't hold a special place in my heart. And stomach.) 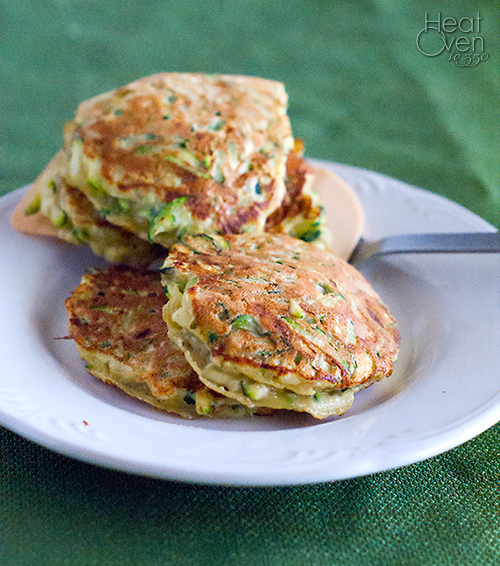 The mild flavor of the zucchini tastes so good with the onion and egg in this recipe, and the overall effect is similar in flavor to a hash brown, but pillowy soft. My girls like to eat these with ketchup, but I prefer them plain. However you serve them, they are a great way to eat zucchini and a delicious breakfast or brunch. Using the large holes on a box grater or a food processor, grate the zucchini. (You should have about 3 cups of grated zucchini.) Place between a couple layers of paper towels and press lightly to remove excess moisture. Place the zucchini in a medium bowl and stir in grated onion and eggs. Add 6 tablespoons of the flour, the baking powder, salt and pepper. If the batter seems to thin after stirring everything together, add remaining 2 tablespoons flour.